So we decided it would be Nicaragua. 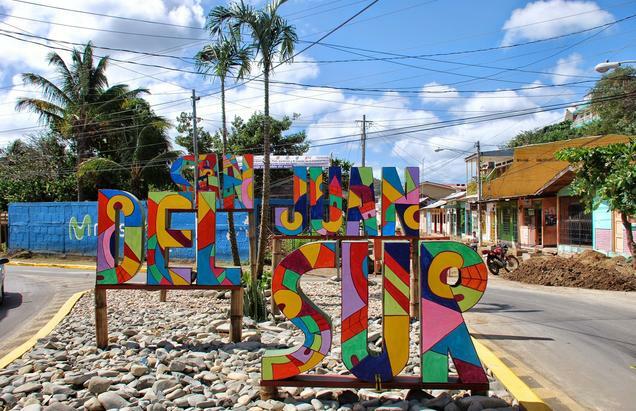 As we started to plan for the itinerary, we found out that we had a better flight deal to Liberia, Costa Rica than going to Managua, Nicaragua. Also we had missed out on Mount Arenal Volcano and Monte Verde Cloud forest when we went to Costa Rica in 2011. So we decided to include these two places as well in our travel itinerary. The trip that did not start with as much excitement ended with so many pleasant memories that we did not want to come back. We got to the airport at 3AM to catch the flight after the ticketing, baggage handling, we were waiting in line to get the security clearance. Once done we went to the boarding lounge to get some food and then waited for the plane. We flew to Atlanta and then from there we took the connecting flight to Liberia, Costa Rica. We landed into their brand new airport ( Last time we were here it was a cement roofed hallway with tables and officials sitting on indescribable chairs ) but this was a spanking new airport with dozens of officials signing off and stamping the passports. The passport officer asked us some vague questions and after listening to our answers, she stamped our passport and sent us with their famous tag line “Pura Vida” meaning pure life. We collected our baggage and waited for the guy from Alamo car rental agency to come pick us up from the airport. We then went to their rental office; we rented our car a 4X4 SUV,a must for the road conditions in CostaRica.This car happened to be a stick shift which was an excitement in itself for Saran. He had not driven one in the past 15 years. So this was an adventure in itself and since I was not going to drive at all I just sat back and enjoyed the scenery as we drove to Monteverde. The road to Monteverde is not a road at all. It is just a pathway on which one can drive but the statement is evident that they do not want tourists by hundreds visiting them! The cloud forests according to the locals are drying up and the rain fall levels had not been the same in the past years. A paved road will only bring tourists by droves and the land does not have the capacity to welcome , feed or sustain that kind of numbers without causing serious damage to the delicate ecosystem. So after a lot of pothole driving and some very deft handling of the unpaved roads by Saran we reached our hotel just in time to watch a beautiful sunset right outside our room. We could see the bay of Nicoya and the Pacific coast from where we stood. We stayed in hotel Camino Verde, 200 mts from the supermarket. yes that is the address , and all addresses in Monteverde are relative as there are no specific numbers given yet. The hotel room was clean the floors were clean, the bathroom was stocked with shampoo, soap, hand soap and towels. There was no TV in the room, but by the number of activities to do you will not have the time for any TV. If you are looking to sit inside a room and watch TV then this is not a hotel to book into. The breakfast is included and the food is good. Parking space is included. This was a small B&B, so you will find no pool, TV, shops, salons, restaurants etc. the room was adequate and most importantly clean! I would recommend it to anyone who is not so uptight about amenities, people are friendly , you can book all your adventure tours right at the reception desk if you are tight on time or walk down to various shops find out the best prices and then book the tour you want ( but no matter what you do; do not miss out the cloud forest tour ) . We went to a nearby joint for food and the lady actually cooked our food from scratch after we had ordered. The food was delicious and we went back to her tiny joint many times in the next two days to eat. We booked the cloud forest tour for the next day at the hotel’s reception. For the afternoon we booked the suspension bridges tour which included a trip to the butterfly garden and the hummingbird garden. We were very tired from the day long travel from our home in US to Monteverde, Costa Rica; so decided to call it a day. We started the day early with breakfast at 7AM and then waited eagerly for the guide to come for us. We drove behind the guide, who came in a minivan, picked up a few people enroute from other hotels and reached the cloud forest around 8AM. We started the tour with the guide telling us about the cloud forests, the animals inhabiting them, how the forest sustains itself, the ecology , the science behind cloud forests etc. We walked about a kilometer , when suddenly there was an excitement among all the guides about a bird spotting ( I did not brush up on this before I left; so I had no idea what we were looking for ). They were delighted that they had spotted “the bird” . The guide setup his monocular on a tripod, focused it on the bird and then gave a chance to everyone in his group to view the magnificent Quetzal bird. Quetzal is the national bird of Guatemala and is almost extinct there. 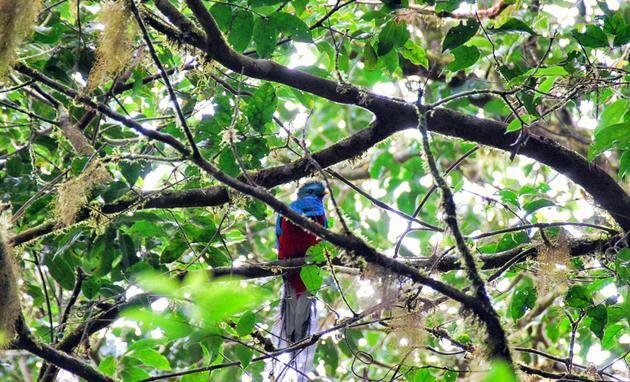 The guide told us how the Quetzal thrived in these forests and that there were about 186 of them in this forest. Though these birds are huge, it is very hard to spot them as the forest is thick and provides good cover. The birds eat the tree avocadoes and have the habit of gobbling down 6-8 of them at a time, then fly to a safe place and regurgitates the food and eats them slowly at a leisurely pace. While we were talking, I saw the bird fly by and perch right in front of my eyes; it was a beautiful sight. The other guide immediately set shop next to my tripod. The bird was visible to our naked eye and through the monocular the sight was spectacular. People started snapping pics like paparazzi ( including me ) of the star sitting more than 200mts away. I got a good photo after a lot of neck cricking. But wow it was worth it! We then continued on our cloud forest tour. After a few meters our guide poked into a tree trunk and out came an angry baby Tarantula (well it did not come all the way out, we had to peer into the little hole with a flashlight to view the orange feet). But yeah we got to see one at daytime. We then moved on and stopped to watch a family of Coatis making their way up a Sapota tree for food. We then moved on and ended at a beautiful waterfall. Took some pictures and started our way back. On our way back we got to see a humming bird’s nest with the eggs in it, we waited for the bird to show up and it did come out to protect its eggs, after watching it for a few minutes we left. Near the exit we went into the hummingbird garden and what a glorious view it was. We got to see 12 different types of these fluttery little things and a bonus watch of Coatis all over again. We then waited to take the ride back to the room and this is where I got to see a praying mantis and a stick insect. All in all a wonderful trip and a good walk up the mountains ! We got back to our room and then proceeded to have lunch at the same joint where we had, had our previous night’s dinner, we enjoyed the meal immensely and then got ready for the second trip of the day, walk the suspension bridges, hummingbird garden and the butterfly garden tour! This time we took the tour van to the mountains and walked the bridges 3KM round trip in all and 8 suspension bridges. The views were beautiful in spite of the clouds coming down on us with a downpour. No clear view at any point and yet it was a beautiful sight. There was a marathon on and the marathoners were running down the mountain all the way to downtown, an awesome sight indeed. After the bridges walk we met with a couple of ladies whom we had met earlier and struck up an interesting conversation. Saran said he did not want to watch the Humming birds again, so I got to watch these angels fly by all over again, stunningly beautiful creatures! We came back to hotel and grabbed a few drinks for ourselves and then I went up in time to capture some sunset photos and a last look at the bay of Nicoya. An engrossing travel conversation ensued with Nic & Abhi, couple of young tourists whom I had met at the hotel. I then went back in search of Saran. We went out to have dinner and then decided to go to the supermarket to get water. We then went out for a walk around downtown where we saw the marathoners completing their race. We walked back to the hotel and slept off soundly, knowing that another day of vacation holds in its palms so many promises! Take the early morning trip to the cloud forest since this is the time birds and animals will be out to find food. Take a guided tour as the guide will take you to the places where the birds and animals are most visible. Do take the canopy tour and the zip line over the mountains. The longest Zip line is 1 Km long. After the zip line tour you get to do the Tarzan jump! We regretted not doing this. 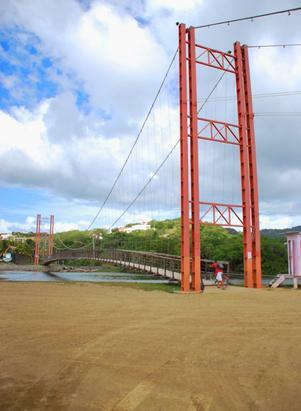 The suspension bridge is a wonderful experience for someone who loves nature. But adrenalin junkies should try the zip line tour + the Tarzan jump. Take a jacket that keeps you warm and keeps you dry. Since it is a cloud forest it can rain anytime. Take water and a bar or two for energy. The shops usually sell butterfly souvenirs which are basically dead butterflies set in a pendant or coaster etc. But find out if your country will allow you to bring back such things, they are pretty expensive to buy and it would be a sad waste if it ended up in trash. The shop girl/ boy will say it is legal but US does not allow you to bring animals live or dead so I am not sure if they will be okay with a dead butterfly (find out before you go on a vacation so that you know what exactly you can bring back). You can however bring back coffee, chocolates, pottery etc. We stayed in Hotel Camino Verde. Here is the link : –http://hotelcaminoverde.com/best_monteverde_hotel_rooms_rates/They were friendly people. The continental breakfast was included, Wifi was included, no TV or AC though (but it got cold enough in the night to warrant a quilt) . The room was spacious and clean. There is a TV in the common area and also 2 computer terminals if you want to check mails. It was another morning when we had to wake up early. We showered , packed our stuff up, had breakfast, checked out, piled our stuff into the car and started our drive to Mt. Arenal the volcanic mountain, which for now is not active. We started the descent down the rocky unpaved pathways and then came to Lake Arenal, a breathtaking beauty in itself. This was one time when I wished my camera had, had a panorama view to click all of it in one go, since there was no way to capture the sweeping landscape in front of me on the normal mode from my camera.This is where our cellphones came handy! The rain hopelessly kept up with its light shower, so I put a towel over my cam and snapped a few photos. Somehow for the past 2 days it was like a curse not a minute of let up with the weather; it was either a shower, drizzle or a downpour. No sign of sunshine at any given point of the day; of course it made up for spectacular sunsets. Anyway off we went towards to our destination La Fortuna hotel in the town of La Fortuna near Mt. Arenal. On our way we stopped by small town and decided to eat at a small eatery which served typical Costa Rican food. We managed to place our order for a simple meal with our sparse Spanish aided by a printed version of Spanish travel phrases, which we took with us everywhere. We had our delicious meal and then after 4 hours of driving we reached our hotel. While we were checking in we saw that Mt. Arenal was right in front of us , so we asked the front office manager if he could give us a room with a view. He said he would check what he could do for us (we had booked a standard double room), after a few minutes he informed us that he upgraded us to a room with a view of Mt. Arenal at no charge to us. We lugged our luggage to our room, dumped it there and snapped a few photos of Mt Arenal from our balcony before going out to explore the city. A view of Mt Arenal from our patio. While walking I spotted a cafe, so we decided to grab a cuppa. The coffee as usual was awesome, but this one was decorated with hearts and flowers, we looked at the coffee with awe not wanting to destroy the coffee art, we decided to drink it subsequently, the coffee tasted just as good as the decorative art. We then walked over to find out about tours to Arenal. Saran then went to get a long awaited massage. Meanwhile I went about clicking photos of the birds and flowers in the park. Once Saran was done we went to check on the tour packages and we found an ideal one that suited our needs and our budget. It was a 6 hour trip with a walk around Mt. Arenal, a trip through the rain forest, a swim at the waterfall, sunset at Lake Arenal, finally a dip at the thermal spring and ending the tour with a private meeting with Costa Rica’s very famous red eyed frog. We booked the tour and then had a sumptuous dinner. After dinner we headed back to our hotel and slept quite fitfully to wake up to a sunrise that never happened and the clouds around us were so thick it seemed like God had photo shopped Mt. Arenal out of the scene. In the dense fog and clouds the mountain was lost. We went down for breakfast, as we were having our breakfast Saran suggested a hiking trip to Mt. Arenal by ourselves, which sounded fabulous to me. Armed with our rain gears, we drove to Arenal and paid for our ticket at the entrance. We decided to first take a driving tour around the mountain. Even the drive was beautiful. I spotted the much coveted Toucan, it was the keel billed variety, while I was snapping away photos another one ( its mate ) flew in. I later found out that Toucans like dolphins mate for life and never change partners; if one of the pair dies then the other partner dies within a few days. We were learning amazing things every day. Anyway we got out, walked around a bit, got back into our car and drove back to the parking lot, We parked our car and then started to walk, Saran got a bit disheartened that it was not as appealing as the drive, so we turned back to go to the car; but just as we reached the car there were two ladies from California who were trying to do the same thing; go for a hike to the volcano. Their spirit rubbed off on Saran too and we decided to go the whole route, thus started our hike to the highest point where tourists are allowed to hike on Arenal. The 4 of us started talking and hiking up. Finally we reached the highest point after getting thoroughly drenched. Took as many photos as the rain would allow us. I then packed my camera in the rain proof jacket. All of us started the descent down, between all this we had discussed a lot of topics including travel, adoption, psychology, driving stick shift cars, childhood etc. with our new friends. After we came back to our cars we exchanged phone numbers and emails promising to be in touch. We then headed back to the hotel just in time for lunch, once we were done we waited in the lobby for the tour guy to come pick us up. The van arrived and drove us to the location. Since it was raining heavily our guide gave us a succinct description and details of Mt. Arenal, then took us on a short walk around the forest giving us tidbits of information about the forest and its inhabitants. We then got to the waterfall which was flowing at full strength due to incessant rains, drowning all possibilities of swimming right out of our tour itinerary! We then walked to a little museum explaining about volcanoes, faults, ring of fire, etc. Then it was time to go to watch the sunset over lake Arenal which again did not happen due to heavy cloud activities. So instead we enjoyed a lovely cup of coffee. Then we drove to Tabacon river thermal spring and this is where the surprise was, we got 75 mins. dip time in the thermal spring to compensate for the disastrous trip. This was sheer bliss after all the walking and hiking I cannot stress how much this was a lovely surprise for all of us, the guide then poured us all drinks and I might add here he poured us a mean drink, not the sloppy watered down kind but a stiff one. Everyone got a face pack with the volcanic soil which the guide had picked up during our hike. The time passed away swiftly and it was time to pack up to go. While driving back he stopped the van near a little bog. He went out in search of the frog , eventually caught one and then gave us all a photo opportunity. We tipped him for his services and got back to our hotel just in time to go have dinner. We ate at a little joint which was just fine and then went back to our hotel and crashed into our bed sleeping almost instantly. 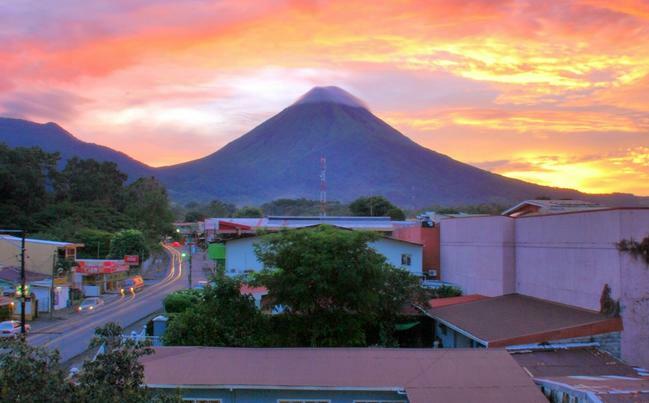 La Fortuna is a small city and you can view Mt. Arenal from every place in the city. People are extremely friendly. Be ready to bargain for your tours as their prices are inflated and discounted depending upon the person buying the trip. Most of the places do not have addresses. So be ready to travel to a destination that is 200mts from the supermarket or a 2 blocks from the city center. Arenal trip; the one that we did by ourselves was very interesting though we did not have a guide. Do note you do not need a guide to hike Mt. Arenal. You can drive by yourself to Mt Arenal. The entrance fee is $10. You do not need a guide to get to the top it is a 3 km hike to the top which actually is not much. We saw a lot of flowers and birds even though it was a rainy day. 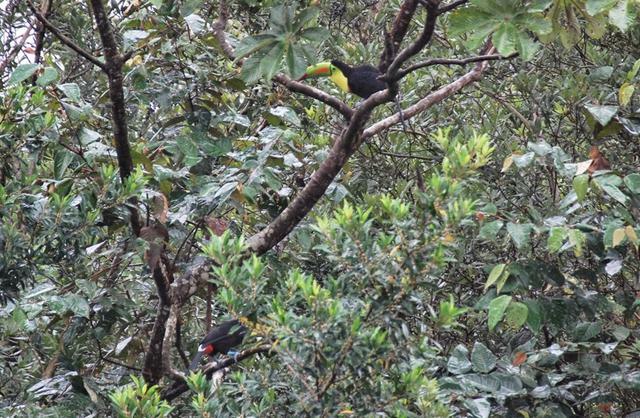 ( we even sighted the Toucan and Montezuma Oropendola on a bad day). You will definitely need a rain jacket that doubles up as a warm jacket (the weather turns practically every minute) . You do not need a tour company to charge you $32 per person at the cheapest and $55 per person at the most expensive to do this tour. The roads are paved and signs are aplenty. Wear hiking shoes as you will need them especially for the last .4Kms to the top where there is no path and you are practically climbing over volcanic rocks. On a clear day you will see the tip of the Mountain ( No one is allowed to hike to the summit as this is a active volcano) and the Pacific Coast. Special Tip for Costa Rica – Their law on shell picking is strict, you can pick all you want but you cannot take it out of CR, they simply confiscate your package. So be kind and leave the shells on the beach. In Costa Rica buy the Kolbi sim card where ever you get it, it is a bit hard to find but has the best network coverage. All Verizon phones come unlocked but the newer phones accept only nano sim, so I suggest carrying a sim cutter or an old unlocked phone that will accept micro sim card. Also before you travel talk to your phone carrier on how to dial emergency numbers when you are traveling to foreign countries. Started the day by packing up all our stuff, had our breakfast, checked out and then started the long drive to Nicaragua. We stopped by a cafe to inquire about the waterfall entry and the lady said it was $15 per person entry fees. 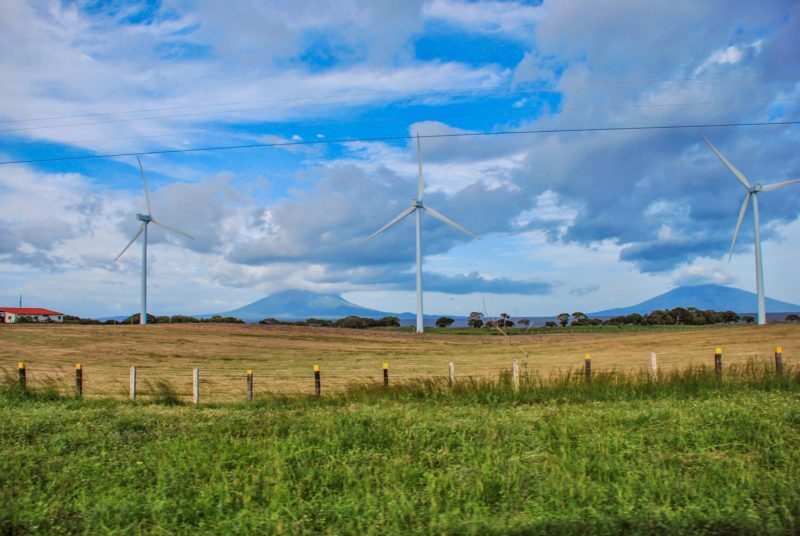 We decided it was too expensive and so had our coffee took a few photos and drove on to our destination Penas Blancas, a city on the border of Nicaragua and Costa Rica. Later we stopped by another little food place had more coffee, packed some fries to go and drove on. We wanted to be at the border well before sunset so that border crossing could be done in a timely manner. After a few hours’ drive we crossed Liberia and reached Penas Blancas. We drove the car to Alamo rental office near the border and handed it over to them. We then pushed our luggage some 250 mts to the border where the customs & border control officer of Costa Rica checked our baggage and then the Costa Rican immigration officer stamped our exit visas. We then walked over to the Nicaraguan border first to the immigration counter filled up the required forms and stood in line for entry visas. The officer asked us pertinent questions and gave us our entry visas. Our luggage went through a visual CBP inspection. We then walked another 200 mts to the Alamo rental office to pick a new car to drive on the Nicaraguan side. We got a Hyundai 2*4 instead of 4*4 which we were not so happy about. Anyway thankfully Nicaragua had proper roads so it was not so much of a headache. Saran was having great fun driving the stick shift. We packed our stuff into the car and drove to San Juan Del Sur which was an hour’s drive away from Penas Blancas. We reached well before sunset but the rain was back again, we searched and searched for the hotel entrance. This search for the entrance took us some 45 minutes, anyway we got to the hotel, parked our vehicle to register ourselves at the front office. The owner himself came running out to help us carry our luggage to our room, we were so touched by his thoughtful gesture, there was no electricity in the area (reminded me a lot of India), the winds had knocked down a power line just the day before and the power company was working to restore power to everyone in the area. We went to our room, which was adequate we dumped our stuff and went out for a walk around the beach, after a leisurely stroll we parked ourselves in a little shack and ordered for beer and chips. We watched a leisurely sunset and started talking to a stranger (Travis) who was a very inviting conversationalist, we decided to have dinner there itself and while talking and looking at the beautiful sunset we gobbled up our dinner which was freshly made. An hour later we said our adios to Travis and headed back to our room, and while walking back to our hotel the rain shower drenched us. On seeing us coming in the owner ran in and handed us each a towel to dry ourselves. Saran had, had a long day all the driving and lugging the luggage around the border etc had sapped him of all his energy reserves. We went to sleep instantly, light or no light nothing mattered, we opened the windows and let the cool breeze in. It was paradise already. Morning will bring more beauty drenched in simplicity to our lives, for now sleep enveloped us in her arms and coddled us to a dreamland far, far away. We stayed in Hotel HC Liri, Liri is a bit expensive but it is the only hotel on the beach for that price. There is a hostel next door for people on budget travel. Liri is on the other side of the bridge, the bridge is a foot bridge and cars cannot go through, also if you are searching for this hotel ask as Liri hotel and not HC Liri; people do not recognize HC Liri. It is a fairly new hotel. The hotel is clean, they clean the common areas 2-3 times a day and sometimes more than 3 times if it is raining. The Owner Maria, her boyfriend and her daughters are some of the friendliest people we have met. They gave us ideas on what to do and told us the safe areas to visit and areas best avoided. I would suggest this hotel to anyone who likes to live in a home for the holidays because that is how we felt, well cared for, like a family member. They do have 2 dogs both are extremely friendly, they will bark at you the first time (well that is what guard dogs are for) but after that they are very friendly. There is a small pool too if you do not want to go out to the beach and there are 3 hammocks that you can laze on. Wifi is free and breakfast is included. There is a soda vending refrigerator in the entrance, which is well stocked with water, beer, soda and juice. The hotel also has a small bar. All the staff are very caring and very friendly. If I were to go back to SJDS for a vacation I would stay here again! oh I forgot to mention beautiful paintings adorn their walls, it is a visual treat. Of course you could just sit and enjoy a beautiful sunset right from the patio. Woke up went down and had breakfast asked Maria if we could get a safe deposit box and she said there was one in their room where they would keep our stuff safely. So we took the required money put our passports, credit cards into a zip lock bag and handed it over to her for safe keeping. We then went to the patio beside the pool and had our breakfast which consisted of rice and beans, toast, eggs, juice and coffee. It was quite a spread , delicious and we ate every bit of it. We met more new people and conversed while we ate. They taught us a few Spanish phrases to get by. They were planning to go to the top of the mountain to Christ of mercy statue for a view of San Juan Del Sur from the mountain. They asked us what we were our plans for the day and we told them we had nothing planned for the day. We wished them happy travels and bid them adieu. We then walked to the beach, but instead of crossing through the bridge we walked through the little river joining the sea to cross over to the other side. We walked around the beach aimlessly then we decided to go into the city and started walking around and saw all the homes painted in pretty shades of blues, greens and reds . Then we came upon a barber shop and Saran decided to get the Mohawk cut for himself I sat there watching and clicking photos, while his hair was getting styled, this style suited him. We then went around to find out about the turtle tours, finding nothing of great consequence we turned around. Saran then decided on taking that long awaited massage while I went walking down the beach . Saran finished with his massage met me at the shack we had gone to the evening before. We sat down, ordered for a drinks and watched the people on the beach, and the kids playing around. This was a vibrant beach but not crowded like crazy, there were just enough people to make it interesting. Saran then decided to go for a dip and I waited for him under the shade. This was the first bright and sunny day we had seen in all of the trip. Not a cloud anywhere , simply put a beautiful day to spend on the beach. This is not the touristy beach front of hotels so there are no beach chairs or lounges you need to get your own stuff and set it up just like we would do on any public beach, this is a good thing in San Juan Del Sur. The hotels have not bought properties along the beach making it exclusive and I hope and pray they stay the same way giving everyone the chance to enjoy the beach area. Saran came back we had lunch with Travis. After a while Saran decided to take a nap by the beach. Later we went for a walk, had a cup of lousy coffee the only lousy coffee of the entire trip, now that counts for something. We then went to our trusty shack took pictures of the sunset, relaxed into nighttime had dinner and walked back to our hotel. Met Sam and his friend again and they had just returned from having a wonderful dining experience Sam told us how interesting and beautiful the trip to the top was and how we should go too. He also said they were going back the next day and how they were getting ready to go to Managua. We asked them if they wanted to accompany us to Granada from where they could take a bus to Managua later in the day ( Granada is on the way to Managua, except for a slight detour), they said they would think about it and let us know in the morning, which we were ok with. We had decided to drive to Granada early in the morning and return back in the evening. We said our goodnights. Another day of our holiday ends. You will find a lot of peddlers selling pottery stuff, bead bracelets, glasses etc. Do buy the pottery stuff from the hawkers and do not forget to bargain , sometimes they have beautiful pieces the kind you might find in an up market, pricey specialty stores. SJDS is a surfers paradise so get a surfboard if you are an enthusiast. Woke up to another beautiful day and went down for breakfast and met Sam and his friend again, joined them at their table and ordered our breakfast a little toned down version avoiding rice so early in the morning. Sam said he decided to join us and if we could drop them at the bus station in Granada in the evening so that they get to Managua by 6PM. We said that can be easily done. So all of packed up and drove to Granada. I had to ask Maria the owner for my locker packet again, already the second time in two days so that we could take our driver’s license out. She promptly bought us our package, we took our stuff and gave the package back to her for safekeeping. We also told Maria that we might not return back in the evening as we were going to Granada. Maria and her daughter immediately gave us tips on where to go and where to stay near the city center and even gave us a card for a hotel where we could stay; meanwhile her daughters told us that we must take the Islets tour, see the Mombacho volcano, thus the things to do in Granada list was drawn out in 7 minutes flat. 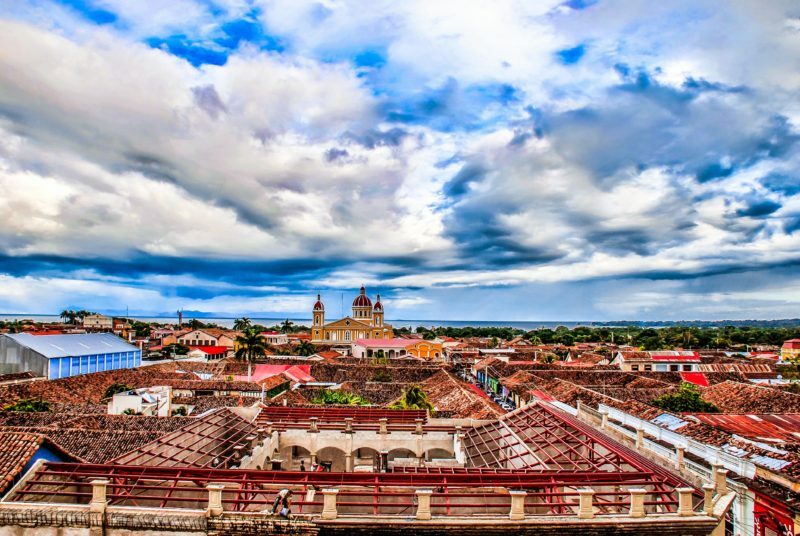 We then loaded our car and took off to Granada , all of us talking about Nicaragua. I was so glad that our friends knew English and Spanish. They taught us more phrases and also did a lot of translating for us, making our lives easier (thanks gentlemen). Once we reached Granada the first thing we did was go to the bus stop to find out about the buses to Managua the timings, frequency etc. Once we determined we had a full day for ourselves the first thing we did was have some coffee, this time we went to a fancy place. It had a fountain, fancy seating and a beautiful ambience. Once done, we took the one hour ride through the city on a horse driven carriage; our driver Mr. Salvador we found out was ambidextrous linguistically. We started our tour at Parque Central , Salvador gave us a quick lesson of history of Nicaragua and then took us to places of interest in Granada. We made our first stop at the old railroad station, we then got to see the old prison (fuerte la polvora), the next stop was the old cemetery where 6 ex-Nicaraguan Presidents are buried, this is a beautiful cemetery where one can spend an hour easily, we got to the independence plaza or the Plaza de la Independencia also known as Plaza De Los Leones. After which we also got to see Cathedral of Granada, La Merced Church ( Iglesia de la Merced ). We went up the tower in the La Merced church, and got to see the magnificent views of the city, Mombacho Volcano and the Cathedral of Granada. We then got to see the Xalteva Church, Poet’s park where every year International poetry festival takes place and poets from all around the world gather here and read their poetry, the next one is in Feb 2014, it will be the 10th annual festival. We then got dropped off at Lake Nicaragua for the tour of the archipelago. This was a 90 minute tour. All of got into the boat and then pushed off the shore asking the carriage driver Salvador to come pick us up on our return. As we left the shore the water turned rocky, a light drizzle of rain had started again well you can only be so lucky, the water got choppier and our boat started to rock and not in the nice way either, I grabbed the life jacket and hung on to the seat and 10 minutes later our dear boatman decided to tell us all about the Islets. First he gave the details on how the volcano had erupted and created the archipelago, then he proceeded to tell us how sharks lived in the lake and so did crocodiles in the same place ( well thank you so much for not trying to scare me) why do they never tell us such things before we start the tour? Though I am pretty sure I would have still taken the tour of the lake , the views were simply breathtaking , we saw the monkeys of monkey island the same one that was perched on Captain Jack Sparrow’s shoulder in the film Pirates of the Caribbean. We then came upon the nests of Montezuma Oropendola (which are similar to tailor birds) and also the birds. We also found out that some these island homes were on sale, and there was one for only $60,000 ( for a minute I wanted this house) anyway after some more lessons on birds, animals and trees it was time to get back which is what we did. Salvador was waiting for us in his carriage we paid the boatman and Salvador, got into his carriage and he dropped us near our parked car, we went to the bus station to drop our friends, we saw them off and then went in search of a place to stay over for the night. We found a hostel not too far off for a fare of $25 we did not haggle over the prices but I am pretty sure it will be much lower if you haggle for the prices. We had free wifi , TV, Cable , no AC though (which was not such a big setback since it was cooler in the night), they did give us a pedestal fan which worked fine. We just took the keys to our room, parked our car and left. We went back to the city center to just walk about and explore on foot after getting a cup of coffee, we heard crackers go off all over the place. We went into the streets to find out little children dressed up as Joseph, Mary, shepherd, shepherdess walking down the street to a live band and crackers bursting all around us, they walked all way to the Church. 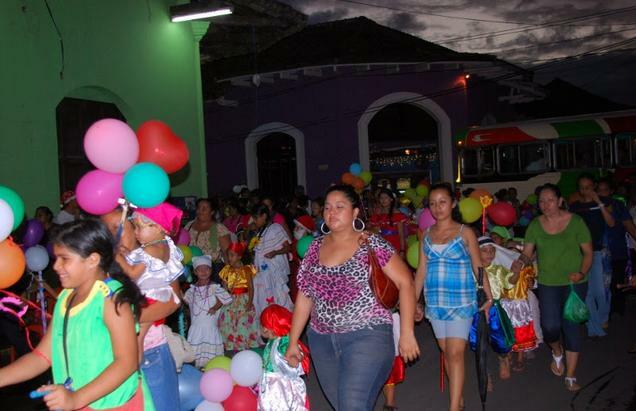 I later found out it was the festival of ‘Pastorcillas’ or ‘Shepherdesses’ and it takes place around the Christmas time. After walking for some more time we took pictures of the Christmas tree all decorated and then bought Nicaragua t-shirts for ourselves. We then walked up to Calle La Calzada not knowing it was the place to be in. We ordered our food and while waiting we had a few boys entertaining with dances on the street. The boys danced to MJ and the ever popular Gangnam style entertaining the crowd thoroughly. There was a live band that took requests, but by this time we were done with our dinner we paid and headed to our hostel. One thing I would emphasize is Calle La Calzada though entertaining has a lot of beggars so beware and keep your stuff with you do not leave your bags unattended. We found our place and decided to call it a day. Granada though is a small city there are enough things to do that it warrants 2-3 days stay at least. Do take the horse carriage tour around the city, the old cemetery is worth a visit. If you are a Cigar enthusiast this tour covers a visit to a cigar factory and a chance to roll one on your own. They quote different prices but the price for now for a single adult is $5 for the 1 hour tour. None of the places have entry fee. So this is a tour with many returns. The tour of the Islets is beautiful, if you are short on time do the boat tour it will include a stop at a restaurant where they will serve you freshly caught fish to order (we skipped this since we were short on time). Ometepe Island is a worthwhile visit if you have time and plan to stay overnight there.Make arrangements to visit the Masaya volcano at night, the night tours start at 5PM and you get to see the lava (we went in too late for this tour). If you are sitting in a open dining area in Calle La Calzada keep all your valuables on you, do not leave things unattended there are beggars all over the place you can absolutely ignore them and not worry. 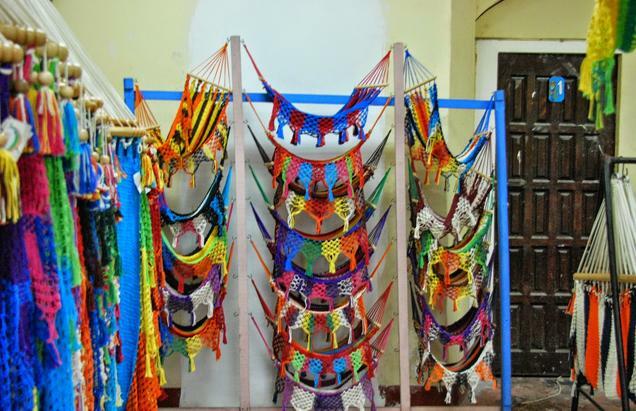 In the city center there is a weaving center where colorful hammocks are weaved primarily; do visit it , it is free , they allow you to take pictures and they do not press you to buy stuff. There are hotels and hostels – Hostels are clean , safe and absolutely fine for a budget traveler or a backpacker, or if you decided to go on a whim without any hotel bookings to Granada (like us) and do not intend to pay through the roof for every night, this is the best time to try the hostels. Woke up real early showered, paid for the room and drove back to our hotel in SJDS which we reached quite in time to have our pancake breakfast that the cook had promised us. The young lady (she is only 18) made us some very yummy pancakes which I gobbled up even without the syrup. We had decided to take this day easy so I sat to have a very leisurely breakfast had a few cups of coffee and surfed on the net. Saran meanwhile got an email from Travis about going to La Flor the tortoise nesting beach in the night, Saran emailed back to him that we were still interested and that we could meet up in the night and drive together. We then found out we were low on cash reserves so decided to get some dollars changed, unfortunately Maria did not have any kind of change ( I was quite reluctant to take my passport anywhere) while my brain was furiously thinking for an alternative, which seemed to be none; Maria very kindly said she could give us some money which we could use and pay her back later (I am blessed I meet people like her,who are so kind, so caring), I thanked her profusely for her kindness and told her I will go to the bank and get it done (plus we really needed the change and we were also going to leave a day later so we needed the change for all kinds of reason. I told her I am going to bother her one more time for my passport which she very kindly brought back from the safe, I took my passport out, thanked her again and left. We walked to the bank I exchanged my dollars and then, dropped our clothes at the laundry shop for laundering, the lady asked us to be back the next day at 10AM to pick up our laundered clothes. I walked back to the room, Saran went for a massage, in the meanwhile I uploaded some photos and read up on current affairs. I then went to our trusty shack and waited for Saran to come, Travis walked in at the same time, we chatted for sometime ordered for some water. Saran walked in, all relaxed. We ordered up food for ourselves (Travis had, had his lunch already). We finished up our lunch, Saran took a nap at the beach, Travis left saying he needed to catch up with some work, I walked back to our room and then took a tiny nap in the hammock. Saran returned and we started to talk about all the awesome people we had met and the places we had been to etc., etc. We then took a nap as we would need to be up till early morning. We got up and then decided to get some coffee and dessert, but before leaving we decided to let Maria know that we were going out for the night and will be back early morning. We found Maria’s daughter instead I told her we were going to La Flor at 11 and intend to be back early morning and if we are not back for breakfast to call the police and file a missing persons report. We then went in search of coffee , we found a wonderful place that sold ice cream and coffee. Well we sat down to enjoy our finds, the ice cream was perfect and so was the sun that was fast setting. After an enjoyable evening, we had dinner and then went back to our hotel. We relaxed for sometime and surfed the net while we waited for Travis (he was going to come at 11PM) . He came promptly on time; all of us left to go pick up Jimmy who is known to Travis, once this was accomplished we drove to La Flor natural reserve ( it is a tropical dry forest). 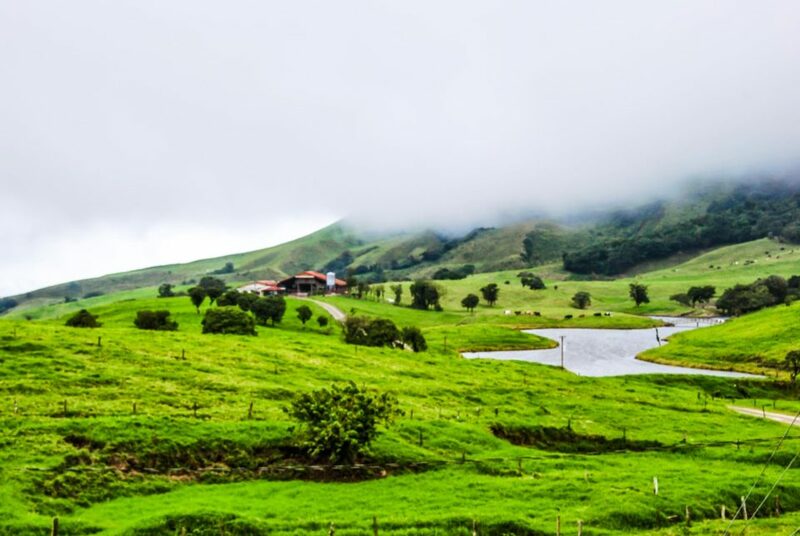 After an adventurous drive of 35 minutes towards the direction of El Ostional we reached La Flor reserve ( the roads to Flor are unpaved and at times testing make sure you drive a SUV or a 4*4 this will help in getting to your destination without any problems). We went in and saw the area was pitch black and wondered where we would get our tickets from. Suddenly the lights came on, and we could see the ticket purchasing desk.We bought our entry tickets, which was $10 per person for foreigners and $5 for citizens . The official said flash photography was fine , but Jimmy who was our guide was very knowledgeable and told us not to do it as it will confuse the little ones trying to make it to the sea. He also cautioned us to walk slowly and watch where we step, in a few minutes our eyes adjusted to the moon light, we started to feel around and were in the lookout for hatchlings. After a few minutes Jimmy spotted one, a few minutes later we spotted another one after many unsuccessful attempts all of us got atleast one decent picture of the little one. We then started walking about in the beach and suddenly spotted two dogs. Jimmy ran towards them only to find a nest disturbed badly by the dogs and many eggs had become the 2 wild dogs dinner. He shoo-ed them off , told us to keep watch while he went in search of the rangers. After 10 minutes he came back with 2 rangers who took up duty to keep the nest safe till the next day after which they can move the eggs to a safe place. While this was going on a big Olive back was making way to the dry land to lay eggs. We stepped back and watched in silence as she made way quietly and quickly, she then started digging quickly and furiously and started to get comfortable, but when the rangers went to check some 20 minutes later there was no results. So Jimmy and the rangers started to dig around the turtle to make her comfortable (they said that sometimes the turtles keep trying to get comfortable but if circumstances are not ideal they will just return back into the sea and comeback at another time). Jimmy and the 2 rangers tried to get the Turtle as comfortable as they could and in this time their shift was over (it was 3 AM) , so they told us that we were the guards on duty for the turtle that had come to nest and the nest that was already there and that we had to take care of both till they send their replacements. So all of us just stayed over looking out. At this time Jimmy told us that the military personnel that were in charge of keeping the reserve safe were very conscientious people, who took their work very seriously and that though there were only 2 people on the lookout on the beach, there were actually another 30 who were hiding among the trees. ( how awesome is that ). The gentlemen from the next shift were already here and it was time to leave. So all of us walked back to the car and Saran took the wheel once again and drove back, this time a little slowly as he needed to concentrate more on the drive, this time it took us 45 minutes to get back. We dropped Jimmy first, thanked him for being so kind to take time off his schedule to go on a tour with us, tipped him (which he very vociferously objected to) said good night to him and then we dropped Travis back (thanked him , of course this would not have been possible without his help) and drove back to our hotel. Honked twice just as Maria had asked us to do; Armando the night watchman came running to open the gates for us. We parked our car and went up to sleep. We woke up late as expected. Who sleeps at 4AM and wakes up early while vacationing? 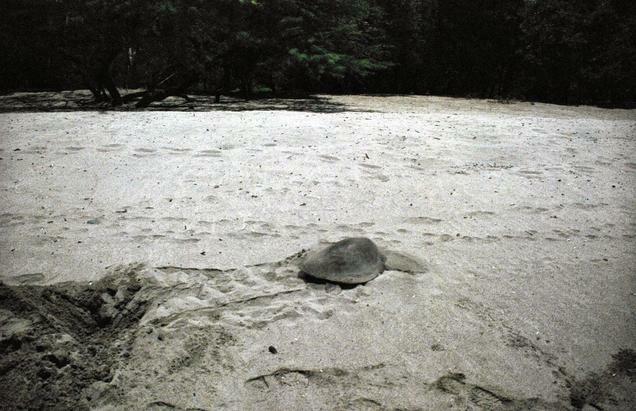 The Olive back turtle that came to nest. The turtle reserve times to go is late in the night. La Flor is well protected by the federal police.The best times to visit is between late July and early December. We did get to see some activity but we were extremely lucky. A 4 by 4 is the recommended vehicle or at least a SUV if you intend to drive yourself. The unpaved roads are tricky and there are lots of twists and turns, there are no road signs nor there are any lamp posts. So be careful and be alert while driving, the potholes are huge. It is advisable that you carry a phone if you intend to drive; because if anything goes wrong with your vehicle there is nothing available for many miles. Carry some water, a light jacket that doubles up for rain jacket too and a small flashlight (bigger ones are not allowed) I used my cell phone light which was enough. This is the entry/exit form common to both the countries. We woke up late decided to take the day slowly, had our breakfast in complete leisure, once done we went to pick up our freshly laundered clothes. It was actually 10AM when we got to the laundry shop, there was a young girl in charge today she gave us our clothes, we paid her and she tried to explain to us in Spanish using a few English words she knew that we need to come back after 2 hours to get our change which was $1. We told her to keep the change and then were walking around when Saran saw the Manual Tricycle passenger carriage and this time he hired it for a ride around the city, we took a short tour, they dropped me by the bridge and then Saran took the rest of the tour, he then went to the barber shop for a hair cut that got rid of his cool Mohawk. We then met up went to the San Juan Del Sur board to take pictures and then decided to just walk around, Saran went for one last massage and I went around the place taking photos. We met up for lunch at our usual place. We came back to the hotel and rested for a while before going out for coffee again. We had some more of the lovely coffee and ice cream at the cafe we had been to before and watched the sun drop down the horizon one last time at the Nicaraguan Coast. Walked about the beach and Saran got a temporary tattoo, I found a beautiful obsidian pendant all hand carved by a Japanese traveling gentleman which I bought promptly. We then walked into our everyday joint to have dinner. One last plate of Arroz con Frijoles con tostadas (Con Pollo for Saran) by the beach, the breeze was awesome, the night was beautiful, the stars were out all twinkling, we had a beautiful dinner date. After paying I decided on a spur to get the 11 and 12 year old kids at the eatery a parting/ Christmas gift, I asked them if they wanted to a t-shirt and both of them said yes they went into the kitchen to tell their mum they were going shopping with me and walked with me all excited, we went to the market and found only one shop was open so the little boy chose a cap and the little girl chose a bracelet for herself I paid and they were so happy (this simple joy touched me deeply), we hugged them goodbye and walked back to our hotel. We settled our dues and took the stuff from Maria that we had given for safe keeping. I packed up most of the stuff as we had to leave early in the morning next day. Maria her daughter, Hernandez came to our room personally to say goodnight and goodbye. I went to sleep late only to rudely awakened by the alarm in the morning. The laundry shops are trustworthy and will not over charge you, negotiate before you leave your clothes (count them before you give them and count them when you receive them). Our clothes came out absolutely clean and I have no complaints on that. Got up real early in the morning, showered, packed and got ready to leave as we were packing our stuff in Maria came out to say goodbye, she hugged us warmly and told us to come again. We thanked her for the hospitality and started the drive to the border. Damien another gentleman we befriended left with us as he too had to go to Costa Rica and asked us if it was ok to ride along till Liberia which we said was fine. We reached the border in 40 mins , our car rental office not open yet, we had breakfast while we waited, Rudolfo arrived at Alamo / National car rental office at around 7:45AM we signed over the car to him and he gave us a drop off till the border. We got out and pushed our luggage towards immigration got our passports stamped , got cleared by customs and then walked over to the Costa Rican border got admitted into the country by Costa Rican immigration once more. Then our luggage was checked electronically by customs. We then walked another 200mts to the Alamo/ National car rental office to get our new car. Damien in the meanwhile found a bus that will take him all the way to San Jose. So he said goodbye and left. We were informed by the agent that she did not have any car but a tiny Suzuki (this was a Maruti swift a midget by our standards) a sedan stick shift only. We had no choice as we had to make it to the airport on time to catch the flight and we were paying $130 per day for this midget sized car. I was totally miffed and absolutely aghast by the kind of ransom they were holding us to. We vociferously protested and Saran was furious, but he found the humor to repeat the famous Seinfeld quote verbatim ” You know how to take a reservation, you just don’t know how to hold it” . We left for the airport , we came to the rental office center at the airport to drop the car off and then took a shuttle to the airport. We were much ahead in time, we had time to buy coffee for ourselves to carry back home. Then we went to have food at Players Bar & Grill, my advice to anyone going to Liberia please walk a little ahead and you will find Quiznos they have nearly the same range of food but no place to sit but trust me when I say this your wallet and budget will thank you later! I have never paid $52 for a burger, a slice of pizza and two coffees anywhere in the world (the burger did not even come with a side of fries). 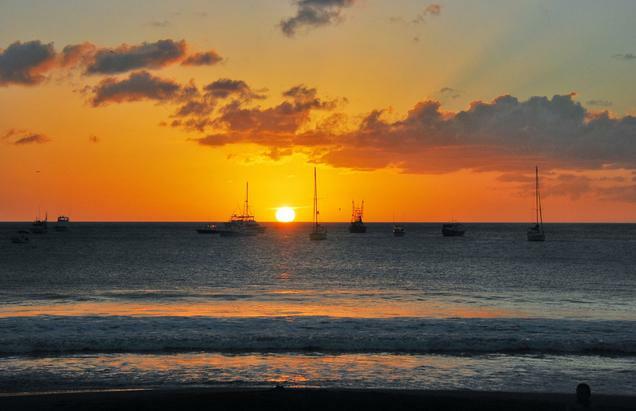 The People , the natural beauty , the colorful locales….. do visit Nicaragua if you get a chance! In Nicaragua Claro has a wide reach among all the phone Sim cards, they are available fairly easily and as usual has a turnaround time of 30 mins for activation. Claro is a Micro Sim Card , where as all newer Verizon phones accept only Nano Sim cards. Nicaragua also has only limited number of gas stations if you have to exchange the car near the border make sure you fill up the tank at Rivas or at San Juan Del Sur as there is no gas station after SJDS, and the border is a good 45kms away. The one near the border is closed but appears on all their maps. Avoid Managua, avoid places with dubious records after 4PM even if it is a guided group tour. There is no price for safety. 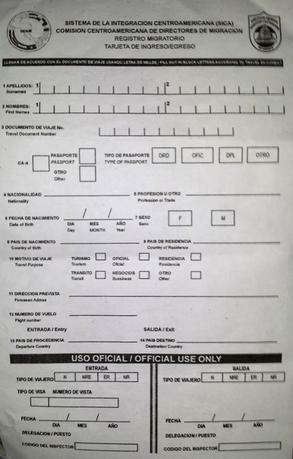 While crossing borders either way from Nicaragua to Costa Rica or from Costa Rica to Nicaragua you will be asked to fill up two forms that are identical in every manner. These will be used as departure and arrival form. The forms are small and take about 5 minutes to fill. They are identical, the questions asked are same and even the sequence of questions are same. Since these are small countries we did not carry much money on us. All the time we carried about $200 split between us and tucked in zip lock bag in a zip up side pocket that is not visible to the eye. We also carried only our I-cards for identification purposes.We also always carry our copy of passport and license on a little drive which we leave in a safe or a safe place. We always talk to people , hotel staff, the car rental agency people to get to know about the safety of a place.Always take heed when people say it is not a safe place to be in, they live there, they know the city best! Carry lightweight jackets that serve dual purposes, same for shoes. We spent weeks planning our trip doing research in tripadvisor, wikitravel and few other sites.We also referred to the US Department of State website for any travel safety warning to that country. If you are traveling from a different nation please visit your country’s travel warning website.